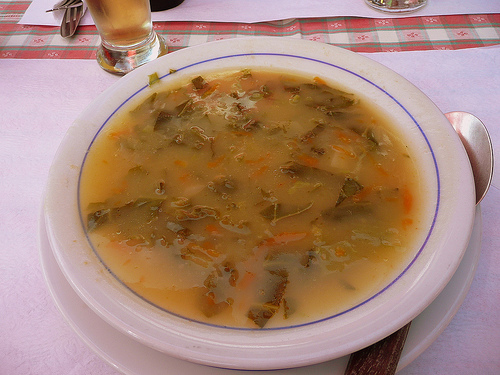 Soup is a comfort food, and the Portuguese have many ways to make us comfortable. We raised our children on the Portuguese soup recipe I am going to share with you. It’s versatile; you add or subtract items as the seasons come and go. Since the soup base needs to be pureed, you will need a food mill, or an immersion blender. The Portuguese were way ahead of us with the immersion blender, and it works like a charm, but the food mill works just as well: you just have to work harder. Soup base: how much you use of each ingredient depends on how much soup you want to make. It’s good left over, so if you find you like it, make a big batch. Peel the potatoes, turnips, onions, garlic and carrots.Cut them into small cubes. Chop the onion, and mash the garlic. Put them all into a large pot, and add the pumpkin. Barely cover with water. Add a spoonful of olive oil. (I usually drop a few chicken cubes in, or use broth.) Bring to a boil, and simmer until the vegetables are tender. Rinse the other vegetables. Leafy vegetables should be shredded or torn into small pieces. If you have green beans, they should be kitchen sliced into pieces about 1/8 of an inch long. Add them to the puree along with a half cup or so of rice and bring to a simmer. Simmer until the vegetables are tender, and the rice is cooked. Stir in some minced Italian parsley, and cilantro to taste. Add salt and pepper if you like. Do you have any favorite soup recipe? This looks delicious! The sweet potato soup was wonderful, by the way. I’m glad you liked it! This one is good, too, and only gets better with time. Not too much time, of course, but a certain mellowing makes the last drop leaves me feeling wistful. I feel honored, Dona Lucia. When we lived in Portugal, the donas da casa served soup every day. It might become a little tradition here in my small corner of Cambridge, too. I hope that it will find its way onto your blog so I can try that, too! I might have to share my infamous spicy fish cake recipe, you know, even though it has absolutely nothing to do with anything. Randomness is my middle name, too. Actually, it is Edna, but I don’t tell people that because I’ve never liked that name. My middle name is Ann! Up until recently, I had to keep checking with my mum as to whether it has an ‘e’ on the end or not as I couldn’t remember. Kids, eh? I dropped mine when I got married and used my maiden name. I tell people that mine is Archie, as I like it better. There you go. I find that quite suitable. Mmm…sounds yummy! Could you send me a bowlful? I would love to send you some. Unfortunately, they haven’t yet invented an email that can safely deal with sending liquids. Or maybe they have and have not yet told us. But it is good. Charlotte’s immersion blender, or boat motor, as a Portuguese (on his mother’s side) chef of note calls it, is probably her favorite kitchen utensil. A Christmas present it was a few years back, and an excellent choice. Thank you. I first encountered the immersion blender in Portugal. When we came back to the states I wondered how I could do some of the things that I was accustomed to do. Like mayonnaise. That looks awesome! Is it a bit like chicken soup? Maybe just a bit. I used chicken broth instead of some of the water…will that do? Oh, most certainly. It looks tops, really. Thank you, Jason. I hope you do try it. There’s a good amount of chopping to get started, but it is worth it. I always make enough to for leftovers because it is better the next day. Fico contente! Obrigada por a visita. I never make it quite the same twice. 🙂 This recipe calls for whiskey, but I prefer to use a white wine. I also make the marinade at least 24 hours ahead, and the longer it sits the better imo. It sounds and looks delicious! Thank you for the recipe. I like the flexibility of the recipe. And I wish I could buy canned pumpkin in the UK. In the US, it was standard at Thanksgiving, and when I moved here I went into meltdown for several years over how to turn an actual pumpkin into the stuff I was used to buying in a can. i have to say, I’d still go for the canned if I could. The fresh stuff tastes better, but the canned is so much easier. I feel your pain re the pumpkin. I was up against it in Portugal. Finally, someone took mercy on me and introduced me to butternut squash and told me to cut it in half and bake it until was tender. Thanks for stopping by! I love this soup growing up! I raised my children on it! I hope to do the same! Oh it is, Jay, it is. Susan: Thank you for the like on my Male Cardinal and Black Squirrel. I enjoy looking at all of the photos.